AUSTIN, Texas (AP) — With an unassuming air and a black Toyota Tundra he says was “the first new vehicle I’ve ever purchased,” Beto O’Rourke has campaigned thousands of miles across Texas and risen to national prominence on a workaday image that aligns with his politics, but not his personal finances. The son of a onetime Republican county judge and a longtime furniture store owner, the Democratic congressman from El Paso married into the family of one of his hometown’s most prominent developers and has assembled real estate investments worth millions. Congress is rife with rich people, but O’Rourke had a 2015 net worth of about $9 million, ranking 51st out of 435 House members, according to the non-partisan Center for Responsive Politics. That’s more-than double the $3.8 million worth of his Republican opponent, Sen. Ted Cruz, who ranked 41st of 100 senators. O’Rourke and his family live in a hilltop, Hacienda-style, 4,700 square-foot home in El Paso, while Cruz, his wife and daughters have a well-appointed condo in an elegant corner of Houston. “I was very fortunate and I recognize that a lot of people don’t have that same fortune,” O’Rourke told The Associated Press after a community college event in Austin, where he wore his usual campaign outfit of simple button-down shirt and slacks. O’Rourke’s rise from punk rocker to star political underdog has become well known as he’s mounted a surprisingly competitive Senate bid for a Democrat in the country’s largest reliably red state. But the more privileged parts of his life don’t fit as easily into his colorful campaign story and are rarely mentioned. O’Rourke champions single-payer health care, raising the minimum wage, reducing student debt and relaxing immigration policies, while Cruz is on the opposite side of those issues. A graduate of a posh Virginia boarding school, O’Rourke and his friend Cedric Bixler-Zavala helped form Foss, an El Paso punk group that toured the country in a station wagon dubbed the “Lumber Wagon.” O’Rourke later quit to get a degree in English literature at Columbia University, thanks, he says, to loans, grants and work-study jobs. Cruz followed a straighter path, graduating from Princeton and Harvard Law School. While he was clerking for Supreme Court Chief Justice William Rehnquist, O’Rourke was scuffling through a post-college New York experience as a live-in nanny for an Upper West Side family, a proofreader at a publishing house and art mover, while also helping his uncle expand an internet service provider firm. O’Rourke’s lean years ended when he moved back to El Paso and co-founded a web design company in 1999. He met his future wife, Amy, on a blind date in 2004 and soon announced he was running for City Council. O’Rourke then got to Congress by upsetting long-serving Rep. Silvestre Reyes in the 2012 Democratic primary. His wife sold a stake worth up to $500,000 in the web firm the same day O’Rourke declared his Senate candidacy. Many O’Rourke supporters haven’t heard about his well-to-do background, though some say it’s no deal-breaker. O’Rourke’s father, Pat, spent eight-plus years as county commissioner and county judge and was so angry about then-relaxed federal immigration policies that in 1986 he sent President Ronald Reagan a bill for $7.5 million that he said the El Paso county hospital spent treating “undocumented aliens” pouring over the nearby border with Mexico. Cruz’s father, Rafael, fled to the U.S. from Cuba with nothing but $100 sewed in his underwear and declared bankruptcy when the future senator was in high school. But Cruz’s wife, Heidi, is managing director of Goldman Sachs Group’s Houston office. Neither candidate needs to open his personal checkbook for this campaign, having raised about $23 million each in what’s become the nation’s costliest Senate contest. O’Rourke’s mother, Melissa, was also well-known in his hometown as co-owner until last year of Charlotte’s Furniture. In 2010, the store paid a $250,000 fine for failing to report cash sales for tax purposes. According to personal financial disclosure records, O’Rourke and his wife still own a stake worth up to $5 million in Peppertree Square, a shopping center where the store was located. Susie Byrd, who served on City Council with O’Rourke, said he grew up comfortable, though not part of a political dynasty. 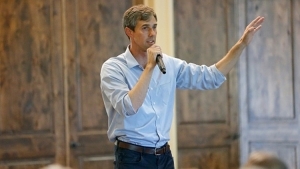 After his father’s death in 2001, O’Rourke became co-owner of the Imperial Arms, an 18-unit El Paso apartment complex valued in financial disclosure records at up to $5 million. He sold that shortly before launching his Senate bid to Patricia “Isha” Rogers, who has contributed more than $11,000 to O’Rourke campaigns since 2012. O’Rourke denied leaning on a donor to cash in, saying much of the proceeds went toward renovation expenses and the building’s mortgage.